We all know that emergency nurses are regarded as a special breed with the ability to keep going no matter what is thrown at us; but that doesn’t stop us suffering fatigue. Resilience is the ability to recover quickly from the difficulties surrounding us but this has become harder to maintain with the relentless challenges the latest winter has presented. As a matron at Barnet Hospital's emergency department (ED), and part of the senior leadership team, I have been concerned with the resilience and well-being of our staff. Through the winter months it was evident that early signs of fatigue were setting in with a slow rise in staff sickness, so we decided to focus on resilience to improve morale and sickness levels, and hopefully give staff the ability to carry on. 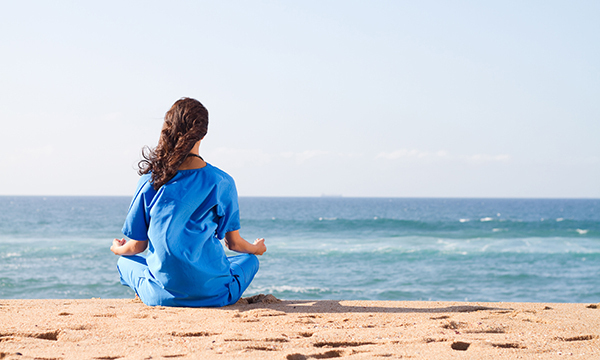 Mindfulness meditation sessions were introduced before the start of each shift. Handover mainly focused on the challenges of the previous shift, which more often than not put oncoming staff into a negative frame of mind before they even set foot into the clinical area. Our staff were open to suggestions of ways to resolve this. Some members of the senior team had recently undertaken a training course involving mindfulness, and one ED consultant practised it daily, so it made sense to use the skills available to us. We began by using a simple mindfulness breathing and meditation exercise, which takes only a few minutes to centre thoughts and settle the mind. It is not a mandatory exercise – all staff are given the opportunity to leave the staff room prior to the meditation – but it has been well received and some medical colleagues who have differing shift start times have been joining the sessions. Along with meditation, we've made it acceptable for staff to talk openly about needing to take some time out to clear their mind and refocus. We also have posters displaying positive, motivating and inspirational quotes dotted around the department to prompt staff to think and reflect during a shift. Our next step is to introduce a well-being and mindfulness board in the staff room to provide reading material, links to useful websites and meditation videos, and an area for anonymous feedback relating to the mindfulness work. Since these changes were introduced, we have seen an improvement in morale and in our staff’s ability to continue providing timely, safe care under pressure. In short, we have a happier workforce. News of our mindfulness work has spread across the hospital and beyond; the senior ED team has been asked to help set up similar sessions in other ward areas and in other trusts. Just a few minutes each day can reap palpable benefits.